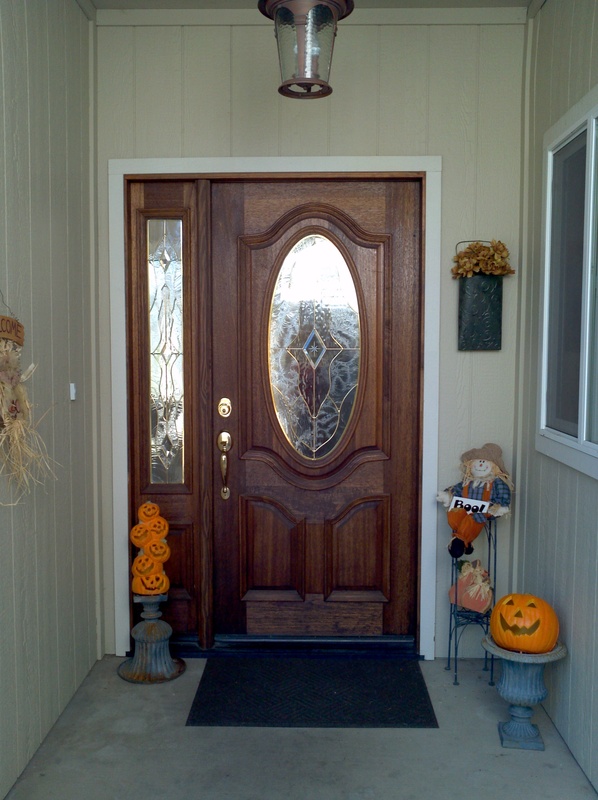 How often do you decorate your front porch? 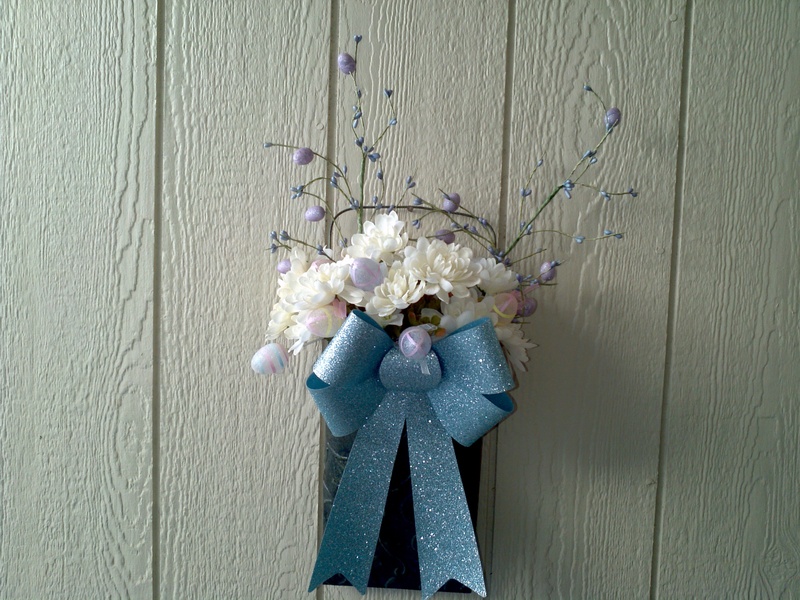 I am embarrassed to admit that, as of last week I still had Easter eggs in my porch’s floral arrangement. Sad, since it is early October. 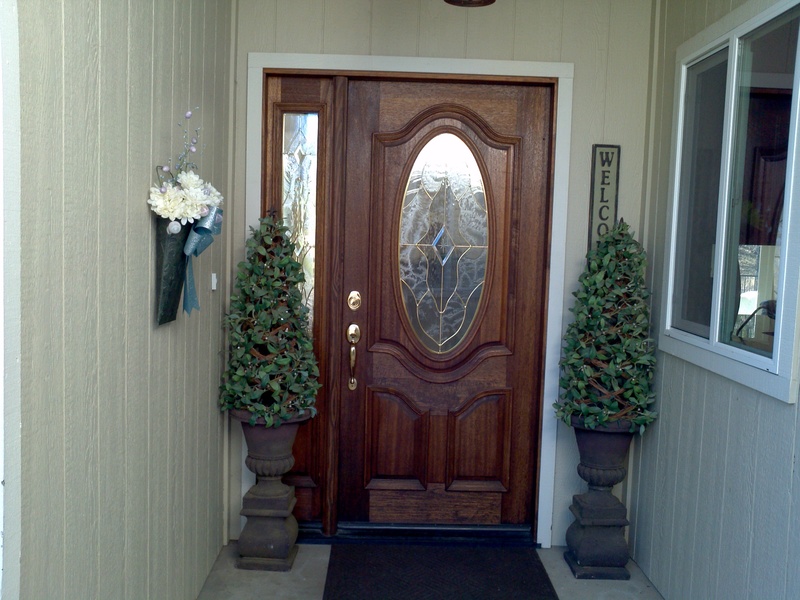 And, yes, those really are Christmas trees flanking my front door, but they have been standing as sentinels right there ever since we moved in 3 1/2 years ago. Again…sad. Talk about boring! 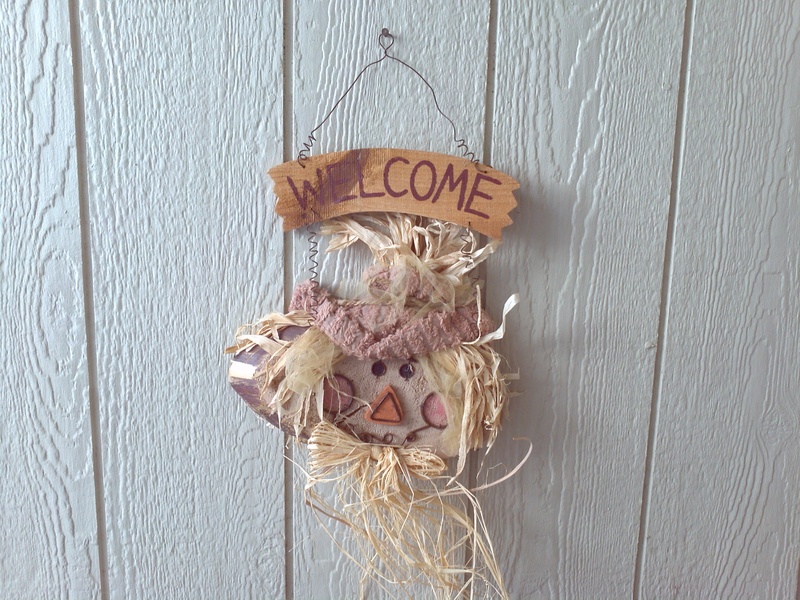 It looked like Michael’s craft store threw up Halloween and it landed up on my porch. Don’t get me wrong…I love Michael’s, (LOVE Michael’s! ), but this display had nothing interesting, different, or creative. Time for an update. I grabbed a branch from a tree that had fallen down on our property, put it in an iron urn, and hung some pumpkin shaped-bells and metal leaves (that I spray painted turquois) on the branches. That gave the display some height. 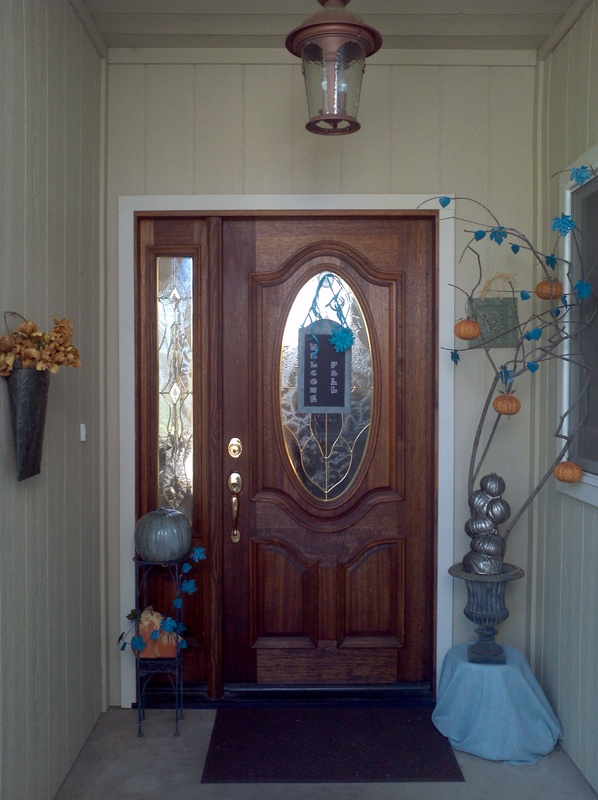 I also spray painted the tall set of pumpkins with chrome and hand painted the single pumpkin a gray-blue chalk paint and then brushed on a super thin coat of Minwax Ebony stain on each. I like how the stain gives an aged, finished look. Although I can do it either way, I decided to display the non-Jack-O’Lantern sides. What else, what else? Oh, yeah. 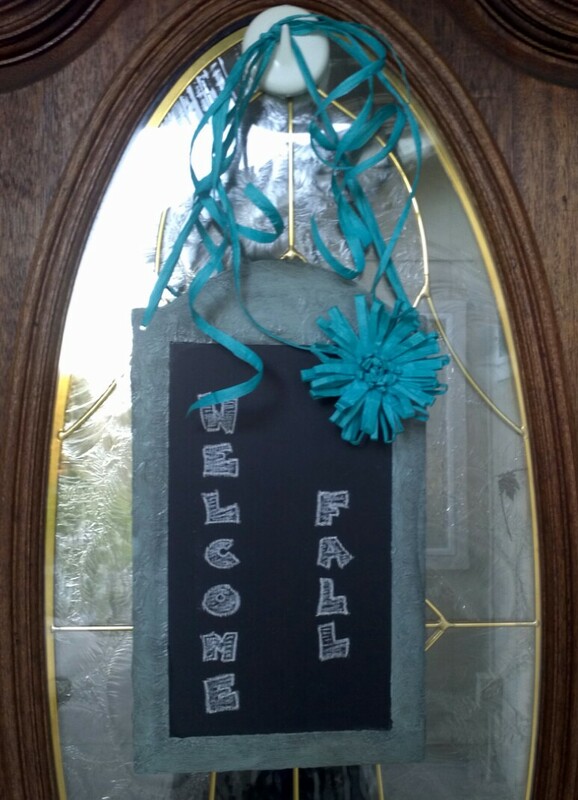 The chalkboard that is hanging on the door, that I gave a tutorial for here. I had promised that I would explain how I did the chalk writing: I used a cool font called Blueberry, typed what I wanted to say, and printed it out. 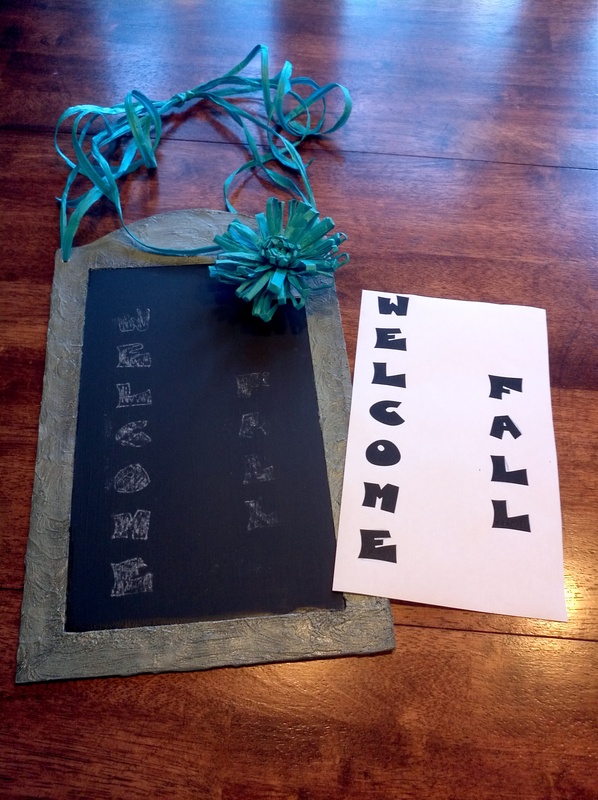 If you want to copy it, click here: WelcomeFallChalkboard. After I printed it out, I ran the long edge of a piece of chalk on the back side of my printed copy- only where the lettering was. I then positioned the paper, right side up (chalked side down) on my chalkboard. Using the rounded edge of a paintbrush (a stylus, pen or Sharpie with the lid on would work, just as well), I carefully traced around each letter. After removing the printed paper, I used the faint chalked transfer lines as my guide. Easy. The whole process took about 2 minutes. Just think of the possibilities of making cool chalkboard art. Nothing over the top or fancy, but like I said before, my goal was to get away from the “look at me, I’m a Fall color” colors this year and try out a totally different color palette . Basically gray, pewter, turquois and just a touch of orange. What do you think? Does it still look Fall-ish?